An elite Louisville task force that intercepted shipments of heroin and other illegal drugs at UPS’ worldwide hub — considered a “primary” drug pipeline for the region — has been disbanded following a police scandal. Louisville Metro Police had led the multi-agency task force for more than a decade, until a probe by the Federal Bureau of Investigation last year uncovered a large theft by one of the task force’s on-duty detectives. LMPD pulled the task force — which included federal agents with Homeland Security Investigations — out of the shipping giant’s Worldport air hub in September and reassigned LMPD detectives to other narcotics operations, a Courier-Journal investigation has found. “Losing that is a major setback,” said Louisville Metro Councilman David James, head of the council’s public safety committee. James, a former LMPD narcotics detective, said he had assisted task force members several times in intercepting drugs at the shipping hub. “Worldport, while they are a tremendous asset to our community, the drug dealers see it as a tremendous opportunity for their businesses — making that one of their primary ways in the region for distributing drugs and funds,” James said. 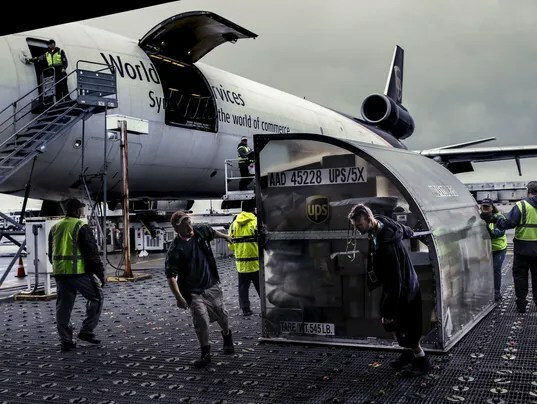 Narcotics investigators across the state are anxiously watching to see if the task force can be restored and operations resumed inside the 5.2 million-square-foot UPS facility, located at Louisville International Airport and billed as the heart of UPS’ global air network. Much of the illegal drugs are shipped from Mexican cartels, said U.S. Attorney John Kuhn, who is over federal prosecutors in the Western District of Kentucky. Investigators have used drug-detecting dogs to intercept packages headed to Louisville or through Worldport en route to other destinations. The task force was disbanded after veteran LMPD Detective Kyle Willett — once featured on the true crime TV show “48 Hours” — admitted intercepting packages, headed from drug dealers to larger suppliers, and taking them to his car several times last year. From January through August, he stole more than $74,700, according to his guilty plea in federal court in December. He is awaiting sentencing. Police are still dealing with the ripple effects of his crimes. “It’s disappointing,” LMPD’s Deputy Chief Michael Sullivan said Tuesday of Willett’s actions and the ensuing fallout. “We suspended what we were doing out there because we wanted to find out what was going on. “We’ll look at policies and practices and see what we did right and what we did wrong,” he said. UPS must consent to allow the task force back on its private property to initiate drug investigations, Kuhn said, otherwise detectives would be required to have a search warrant, hamstringing investigators battling the region’s heroin and opioid crisis. “The task force removed itself from Worldport. We did not remove them,” UPS spokesman Mike Mangeot said. UPS has continued in-house security measures to intercept illegal packages and has called in LMPD and various law enforcement across the country, Mangeot said. He declined to discuss specifics. Willett and Barth were part of a task force that in 2011 had earned a competitive spot in the federal High Intensity Drug Trafficking Area program, a designation by the Office of National Drug Control Policy that requires federal, state and local partnerships. Investigators with Kentucky State Police and the Jefferson County Sheriff’s Office were also part of the task force. Their HIDTA team, known as the parcel interdiction task force or Airport Interdiction Unit conducted frequent inspections of shipments headed to or through Louisville in a partnership with UPS as well as other shipping companies like DHL Express, Fed-Ex and the United State Postal Service, which Kuhn said also are used by drug traffickers. Within days of the task force pulling out of Worldport, LMPD officials also halted participation in the HIDTA program, which had augmented the task force with about $200,000 annually and linked its members to a network of resources and training. Appalachia HIDTA executive director Vic Brown, who oversees 34 HIDTA initiatives in Kentucky and three other states from his London, Kentucky, headquarters, said LMPD officials told him in mid-September they were suspending requests for HIDTA funding — after the FBI investigation of the task force was made public. A California drug task force called LMPD last year to report something amiss at Worldport. Chief Steve Conrad referred the case to the FBI. The federal investigation included watching task force members on video surveillance. Something they discovered lead to the initial criminal investigation of Barth. Five months later, the department hasn’t issued any news releases on the task force or any follow-ups on Barth. The detective didn’t want to discuss the investigation with a reporter, according to his attorney, Steve Schroering. But Schroering said he was told several weeks ago that Barth wouldn’t face criminal charges federally or at the state level. “Tommy Barth did not break any laws whatsoever and he’s looking forward to resuming his career with the police department,” Schroering said. On Monday, Mitchell confirmed an ongoing internal investigation by the Professional Standards Unit, which evaluates if any departmental policies or procedures have been violated. Neither Barth’s attorney nor the department spokesman would discuss the nature of the ongoing investigation. Kuhn confirmed that Willett was the only task force member his office planned to prosecute. Still, he acknowledged that rebuilding trust between UPS and law enforcement will take time. He has discussed intensifying management and oversight of the task force, possibly designating Homeland Security in a co-leadership role with LMPD. LMPD’s Sullivan called discussions with UPS “very preliminary,” too early to predict how the task force would be structured. He said the department is still reviewing policies and procedures of the operations to see if adjustments need to be made. “We want to make sure we have the systems in place to mitigate the possibility of these types of things happening in the future,” the deputy chief said. As to whether the task force could resume participation with the HIDTA program, Brown said: “If they come back to us with a proposal and are back to work, we would consider funding it again.